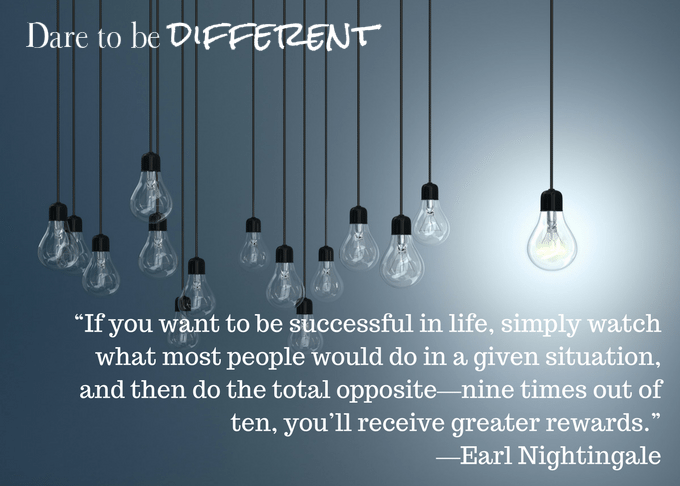 If you want to live it forward and become a great leader, you have to dare to be different. The reason? Most worthwhile goals require you to swim upstream. And let’s face it, swimming upstream is more challenging than floating downstream. That’s why the word “dare” fits so well with “different.” It takes guts to live it forward. But not just guts. Effort. Push. Drive. 1. Why do I want to get better in this area? 2. What positive affects will you see in your life by improving in this area? 3. What one action can you take this week to get one percent better in this area? Action Step: Don’t think Top 10 List. Don’t even think two or three actions. Focus on improving in just one area by just one percent each week. Do this and within a matter of months you’ll be shocked at how you stand out from the crowd and how well you show up and shine! Questions: Which question is most important to you as you dare to be different? Are there any questions you would add?